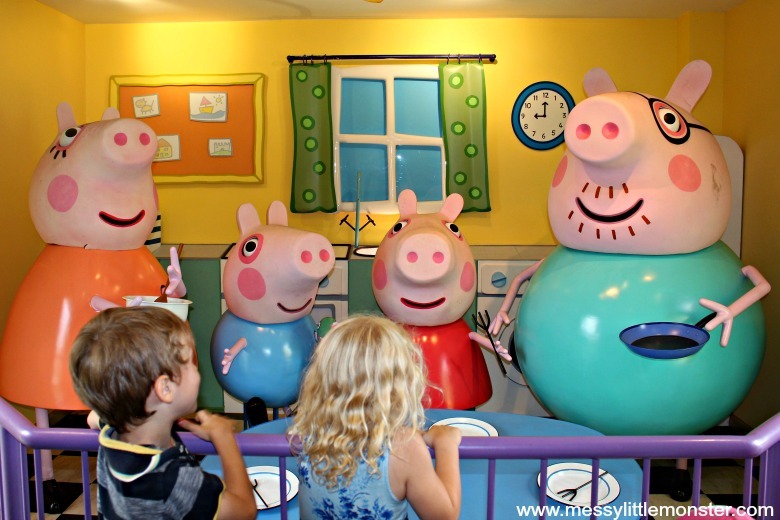 Visiting Peppa Pig World, which is located inside Paultons Park Theme Park, is an excellent day out if you have any Peppa Pig fans in the family! Preschoolers will love the rides, meeting the Peppa Pig characters and playing in the splash park. 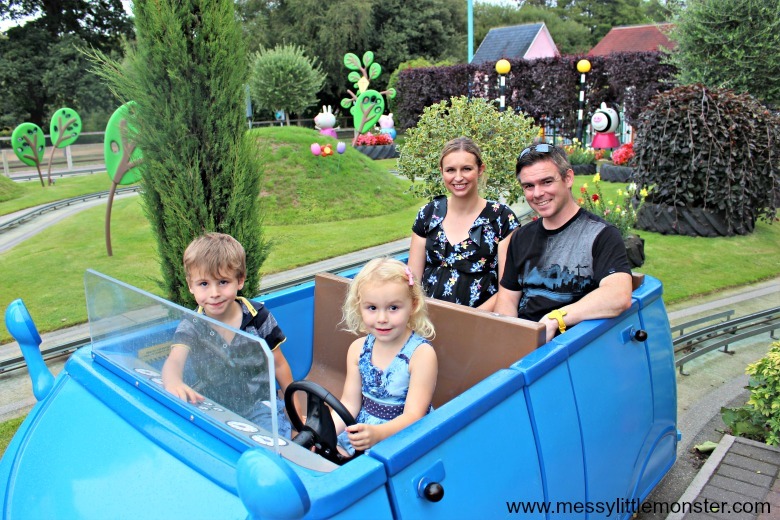 Read our review on Peppa Pig World to see why we think Paultons Park is an excellent family theme park for toddlers, preschoolers and young children. We went to celebrate Daisy's 4th Birthday (along with Harry who is nearly 7) and they both had an amazing day. Peppa Pig World is inside Paultons Family Theme Park. It is located near Romsey in Hampshire in the UK. 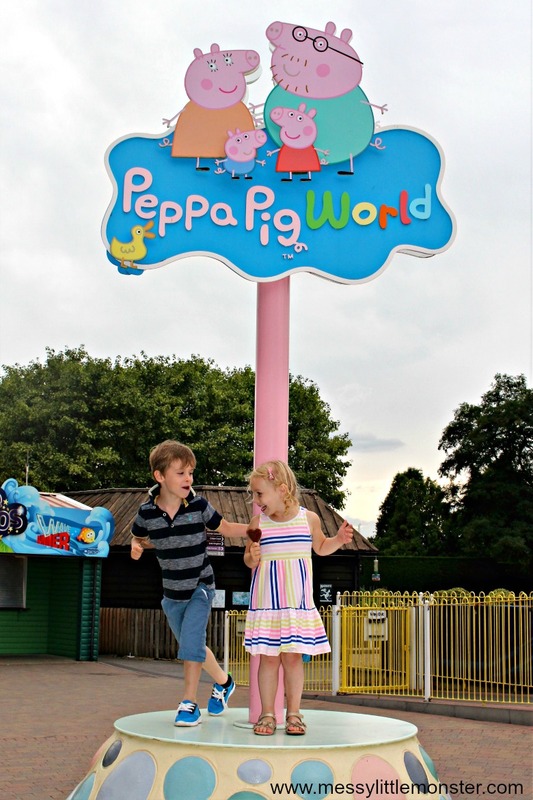 What age children is Peppa Pig World suitable for? 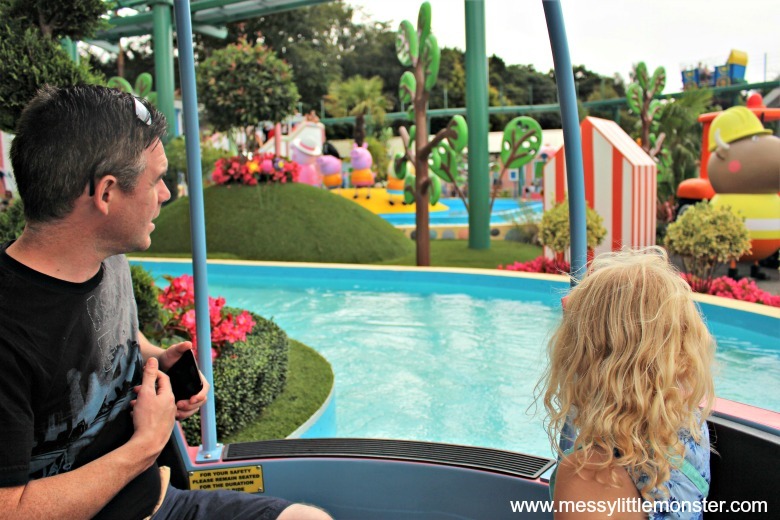 Peppa Pig World is perfect for small children. The rides are quite tame and seem to be enjoyed by everyone. We decided to leave Oliver (6 months) at home, but there were lots of people with babies on the rides. You aren't able to have pushchairs with you while queueing for the rides so if you are taking really young children you might need to think ahead and bring a small bag to take on the rides full of essential baby supplies! 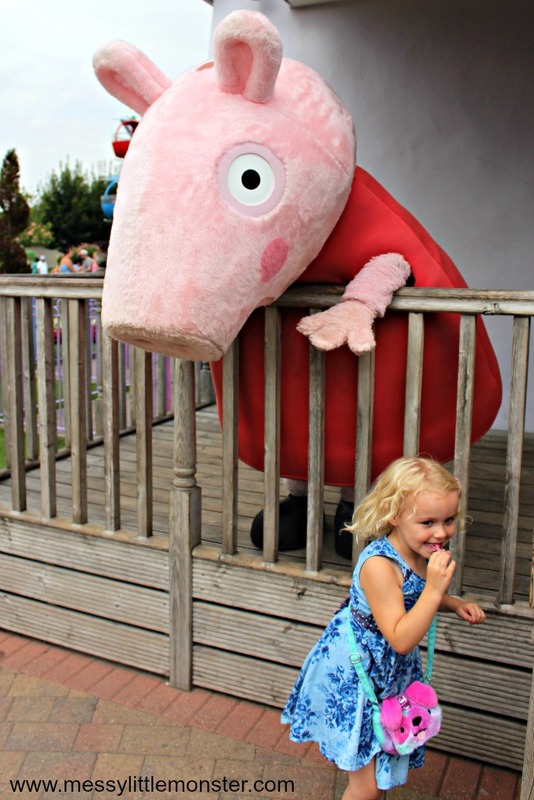 Paultons park recommed Peppa Pig World for children aged 1-6. The average age of the children at the theme park on our visit was probably about 3, but there were also lots of toddlers and older children, Harry and Daisy (aged 4 and nearly 7) loved it. We also went when Harry was almost 2 and he loved it just as much at that age. 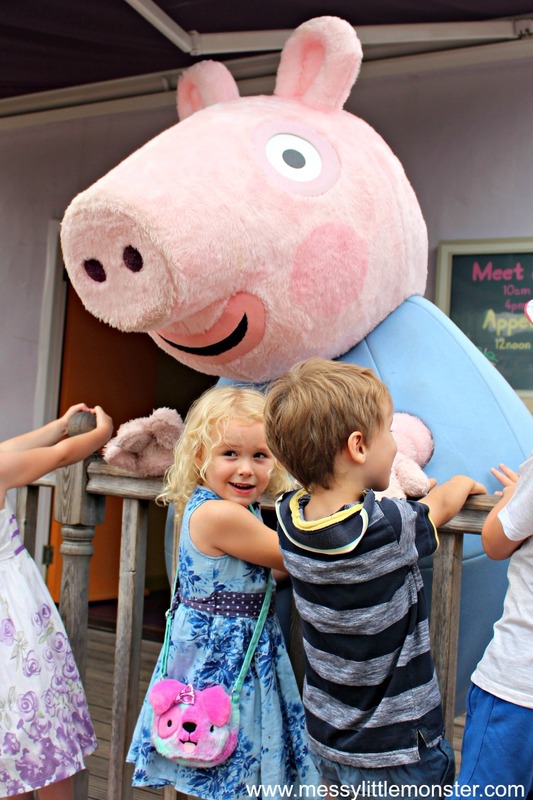 I think if your child enjoys watching Peppa Pig then they will enjoy a day at Peppa Pig World whatever their age! How much are tickets to Peppa Pig World? The price for tickets to Peppa Pig World is £34.25 each, for both adult and children's tickets (children under 1m are free). You can save by purchasing your tickets in advance or buying a family ticket and there is also a 2 day offer. For updated prices and to book head over to the Paulton Park website. Your ticket to Peppa Pig World includes all of the attractions within the Paultons Park family theme park. 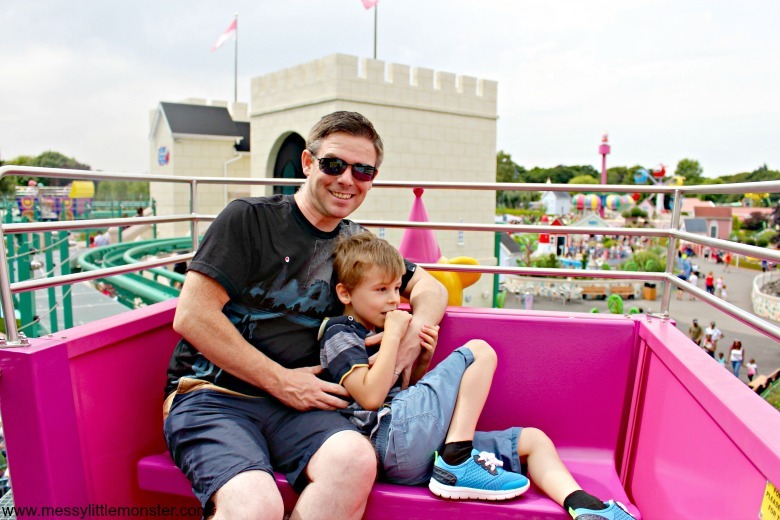 There are lots of rides close to Peppa Pig World that are suitable for young children. How big is Peppa Pig World? Peppa pig World has plenty to do. There are 9 rides, Mr potato's playground, an indoor soft play zone and a splash park. We found that for us there was actually too much to fit into one day, so we didn't make it onto all of the rides. You can see full details about all of the attractions and rides at Peppa Pig World here. We had a brilliant day out celebrating Daisy's birthday at Peppa Pig World. If a member of your group has a birthday on the day of your visit make sure that you tell the staff on your way in. Daisy was wearing a birthday badge and when the staff spotted it they gave her another paultons park birthday badge which I thought was a nice touch. Once inside Paultons Park it took us a few minutes to find Peppa Pig World. 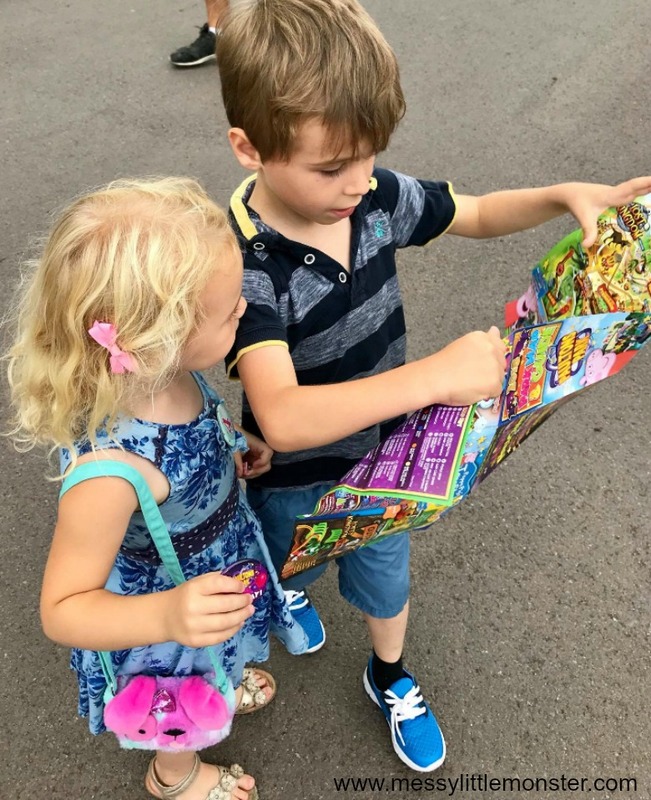 The kids loved using the park map to help us find the way! The kids were so excited to explore Peppa Pig World. Daisy wanted us to head straight towards the Queens Flying Coach Ride, one of the parks newer rides. The Queens Flying Coach Ride is a gentle ride with views over the park so it was a great place to start. On the day we went the queues were about 20 minutes long, but they seemed to go quickly. During the last hour of the day the queues suddenly seemed to disappear and we didn't have to wait long for each ride. Whilst on the Queens Flying Coach Ride Daisy spotted Grampy Rabbits Sailing Club Ride so this was our next ride of the day. Again this was a really gentle ride, we were spun around gently as we moved through the water looking at models of different Peppa Pig characters. The kids loved Peppa Pigs Balloon Ride, this wasn't quite so gentle as it was slightly higher and spun around a bit, but I think that's what the kids loved about it! They also had fun driving us around on Daddy Pigs car Ride. 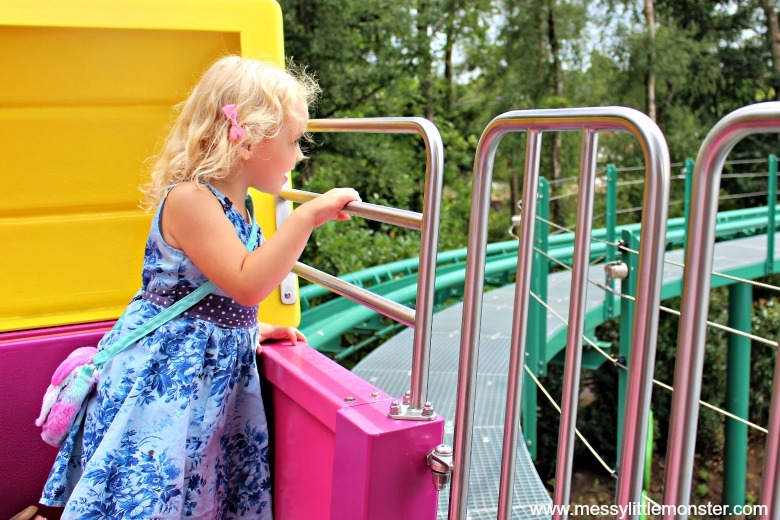 The other rides available inside Peppa Pig World are; George's Dinosaur Adventure, Grandpa Pig's Little train, Grandpa Pig's Boat Trip, Miss Rabbits Helicopeter Flight and the Windy Castle Ride. 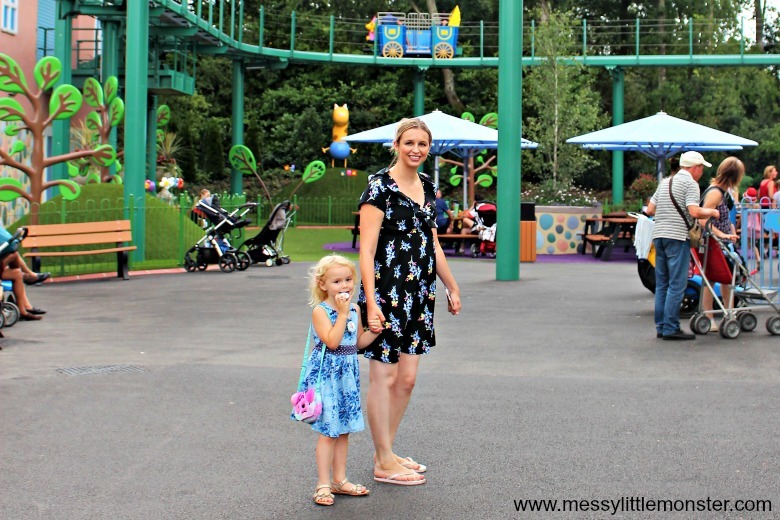 We also ventured just outside of Peppa Pig World where there are more rides that are suitable for young children (e.g. a carousel and a train ride), but with much shorter queue times. Meeting the characters from Peppa Pig was definitely a highlight for Daisy. She was a little shy at first but before long she was giving them all a big hug. Peppa Pig and George appear outside the school house at set times so you can have a photograph taken with them, but the other charcaters are walking around the park throughout the day. Daisy managed to get a cuddle from Mummy Pig, Daddy Pig, Zoe Zebra, Peppa Pig and George. There are lots of models of the different charcaters around the park too. You can also go into the school house for a photograph and into Peppa Pig's house where the models tell a short story. When I asked the children what they most enjoyed about the day they both said the splash park. We left going to the splash park until the end of the day so that the kids werent soaked for the rest of the day! 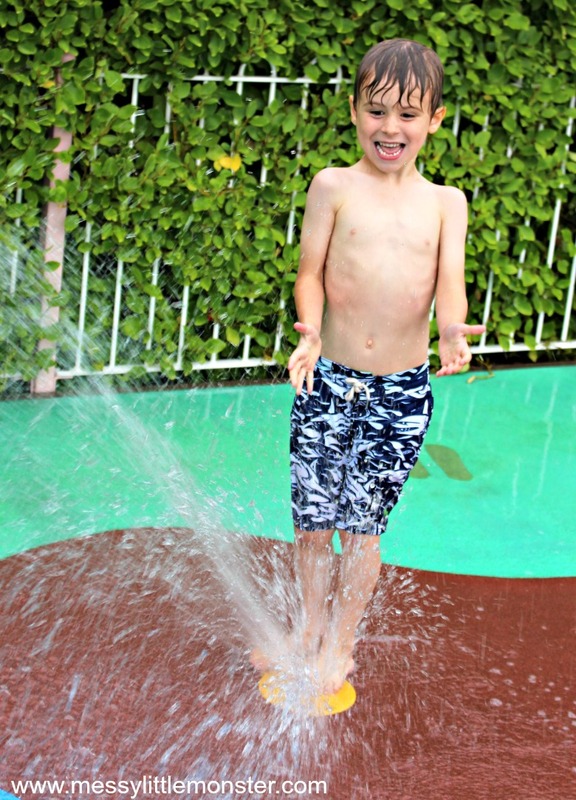 Luckily we knew about the splash park so we had packed swimwear and small towels in our bags. 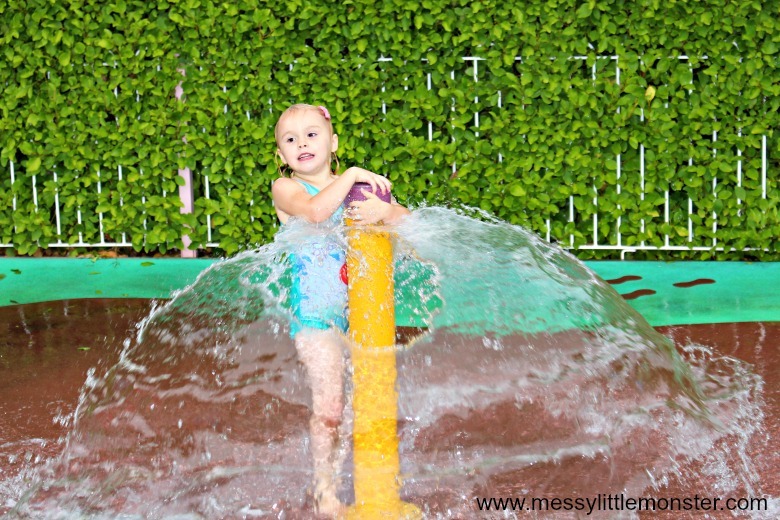 The splash park can be found by going through Mr Potatos playground. The kids had lots of fun in the playground too, the only thing that we didn't have chance to do was take advantage of the indoor soft play. 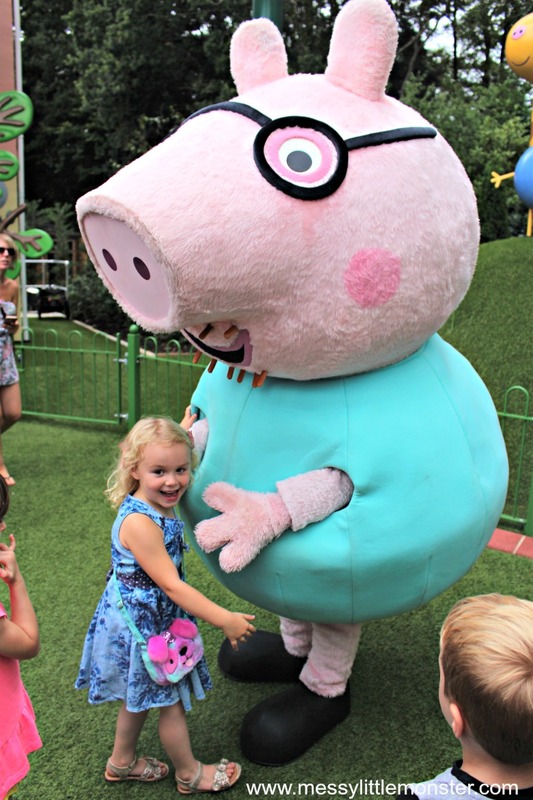 Peppa pig world is a great place for young children. 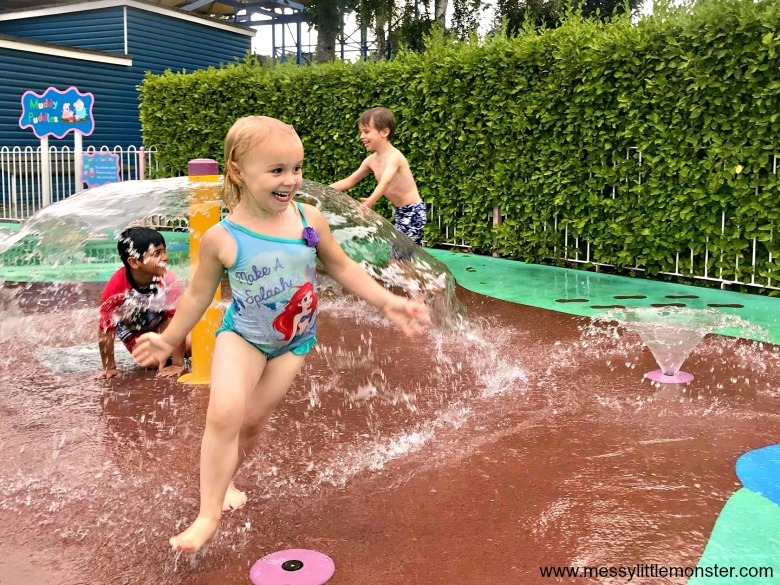 The rides are gentle, the splash park is amazing and there are lots of opportunities to meet the characters from Pepppa Pig. 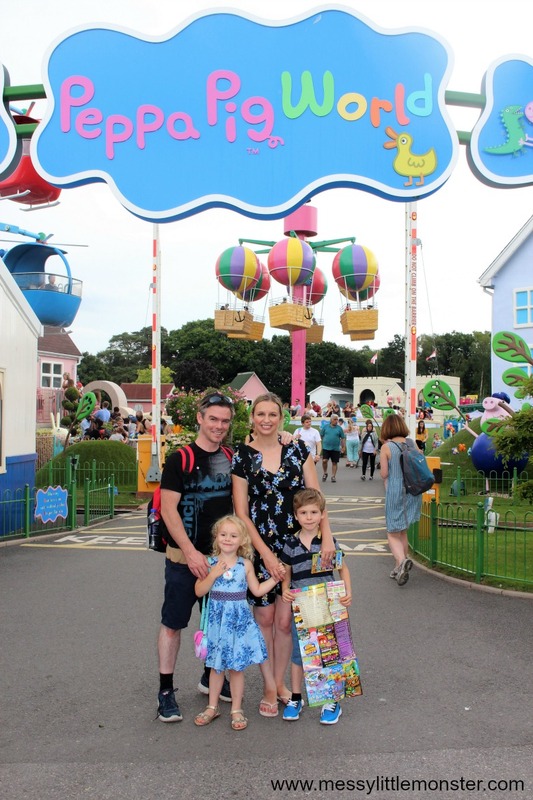 I would definietly recommend Peppa Pig World and the rest of Paultons Park and we will be back! 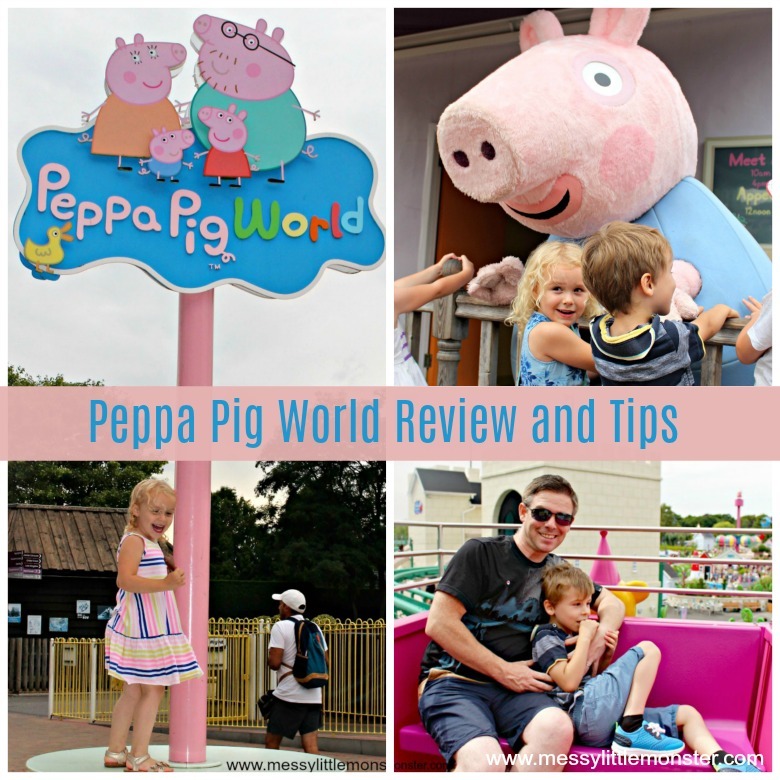 So after reading this Peppa Pig world review if you think you would like to go for a visit here are our 5 top tips. 1. Think about the day you are going. The queues are going to be longer in school holidays and at weekends. If you go on a busy day maybe try and go on the popular rides at lunchtime when others are eating or towards the end of the day once some people have gone home. 2. Look at the ride restrictions in advance. You can see all the details of the rides here. There is nothing worse than your child getting all excited about going on a ride only to find out they aren't the correct age or height. 3. Take swimwear and socks. If you want to use the splash park you will need swimwear and a small towel and for the indoor soft play area you need to be weaing socks. 5. Bring a camera. The kids will have so much fun you are going to want to record a few of the special moments! 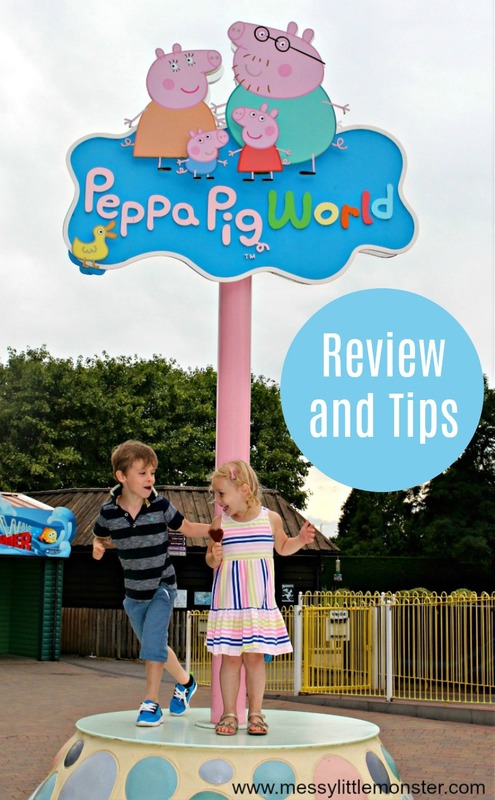 We hope that this Peppa pig World review has been helpful. We had a fabulous day at Paultons Park family theme park and we hope that you do too! Disclosure: Paultons Park sent us tickets for the purpose of this review. All thoughts and opinions are our own as always. Thank you we had a great day!